I’m always surprised where my inspiration comes from for my quarterly reviews. This quarter it comes from a photo of my 3-year-old son getting his first official military salute from Vice Admiral Mike Shoemaker, who was the Grand Marshall for this year’s 4th of July parade in my hometown of Coronado, CA. It may also very well be Vice Admiral Shoemaker’s first salute from a 3-year-old boy. My son then gets pretty serious and overcompensates for each move and I’m trying not to laugh with a dramatic seriousness on my face. Me: “Hair looks good. Open your mouth ahhhh. Eeeh. Teeth are clean. Face is clean. Let’s check your hands. Hands out. OK, clean. Pajamas on. You passed inspection! Very good job. Dismissed!” This is where the salute comes in. And yes, there are many nights I forget to inspect him and he’ll follow me around asking for an inspection every 15 seconds until I get to business. Again, this is in part fun, but also in part instills discipline, a sense of accomplishment and teamwork in our relationship. The photo got me thinking about the broader context of why we do inspections and it comes down to this: you can save yourself a lot of future problems by having an experienced and knowledgeable set of eyes looking at things for you and providing objective advice. In the military, inspecting a weapon, a field kit, or an ejection seat can save your life, but even inspecting your car tires or brake pads can have the same result. As a CERTIFIED FINANCIAL PLANNER™, I have the experience and expertise to inspect areas of your financial lives, for which there should be any number of inspection points. Estate Plan: Most people should address their estate plans periodically, including wills, power of attorney (POA) for finances, POA for medical decisions and beneficiary designations, to name a few. One item that should be included that I don’t see much is “Wishes of the Deceased” — things like where you want to be buried, who you want involved, what kind of ceremony you want with contact names and phone numbers of those to be involved, etc. Retirement Plan: How do you inspect a retirement plan? You use the best technology and planning tools to determine the probability of NOT running out of money in retirement. It’s critical to have a discerning eye clarify the assumptions with you. A mistake I often see is using a constant annual investment return in projections, like 6% every year, for example, to determine results. In my opinion, this methodology will be so far from reality so as not to be useful. A better way to project your probability of success is to use statistical monte carlo analysis. An example of the tools I use for my clients is here: WP360 Demo. Investment Portfolios: Continual monitoring, rebalancing, and alignment with personal financial goals is very important. We can inspect and manage portfolios to create ideal portfolio characteristics. Risk Management: Risk management includes partially protecting yourself against situations that could cause all your hard-earned financial success to be destroyed. Things to look at are long-term care insurance, life and disability insurance, property and casualty insurance, and even setting up trusts for special circumstances. Financial Plan Reporting: This is where you, the financial advisory client, get to do your inspection on the work being done on your behalf. Everything should be gathered together in a simplified format for easy review and discussed with your financial advisor within the context of any changing priorities and benchmarks. Call it what you will — an inspection, a second opinion, an audit or whatever term you use — you are helping ensure the peace of mind you are working so hard for becomes a reality. Every reported stock and bond index was up, up, up this quarter. For stocks, MSCI Emerging markets had the highest return at 6.38%. Interestingly, for Emerging Markets, Greece had the highest return of 34.11%, while Qatar returned -11.23%. US REITs trailed the reported stock categories at 1.48%. Interest rates were mixed across the U.S. fixed income market during the second quarter. The yield on the 5-year Treasury note decreased 4 basis points (bps) to 1.89%. The yield on the 10-year Treasury note decreased 9 bps to 2.31%. The 30-year Treasury bond yield decreased 18 bps to finish at 2.84%. Should stock investors worry about changes in interest rates? Research shows that, like stock prices, changes in interest rates and bond prices are largely unpredictable. It follows that an investment strategy based on attempting to exploit these sorts of changes isn’t likely to be a fruitful endeavor. Despite the unpredictable nature of interest rate changes, investors may still be curious about what might happen to stocks if interest rates go up. Stock prices might rise or fall with changes in interest rates. For stocks, it can go either way because a stock’s price depends on both future cash flows to investors and the discount rate they apply to those expected cash flows. When interest rates rise, the discount rate may increase, which in turn could cause the price of the stock to fall. However, it is also possible that when interest rates change, expectations about future cash flows expected from holding a stock also change. So, if theory doesn’t tell us what the overall effect should be, the next question is what does the data say? 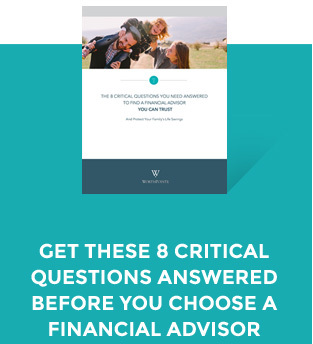 Recent research performed by Dimensional Fund Advisors helps provide insight into this question. It basically tells us there is no clear pattern in the correlation between interest rate movement and stock returns. For those of you who would like to dig deeper into this topic, feel free to watch this video by Wei Dai, Ph.D.
Morgan H. Smith Jr. IMBA CFP, who has been a fee-only financial planner for over 12 years, specializes in wealth management for successful families, business owners, retirement plans and institutions requiring a disciplined fiduciary process. An Assistant Professor at the University of San Diego, Morgan has been a frequent speaker to many professional organizations and has appeared on CNBC, Fox Business New Live and is a founding member of the Strategic Trusted Advisors Roundtable.